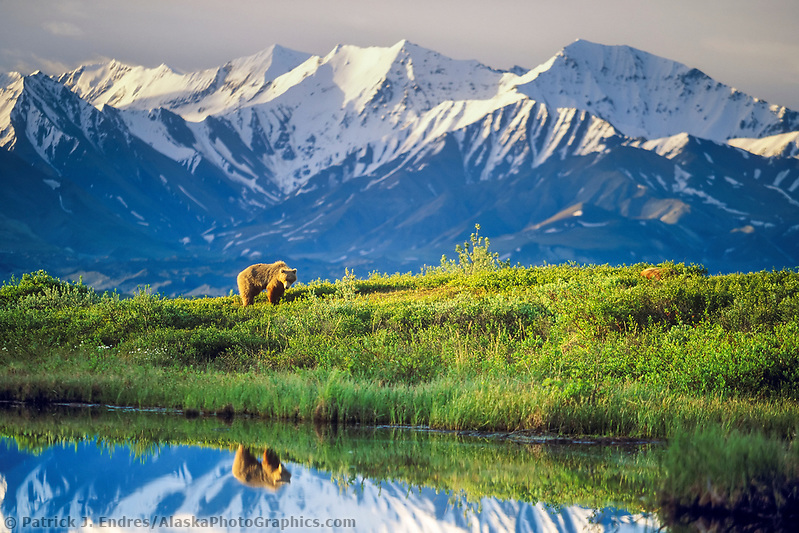 Alaska is unique in that it is home to all three species of bears: brown & grizzly bear (same species), black bear, and polar bear. 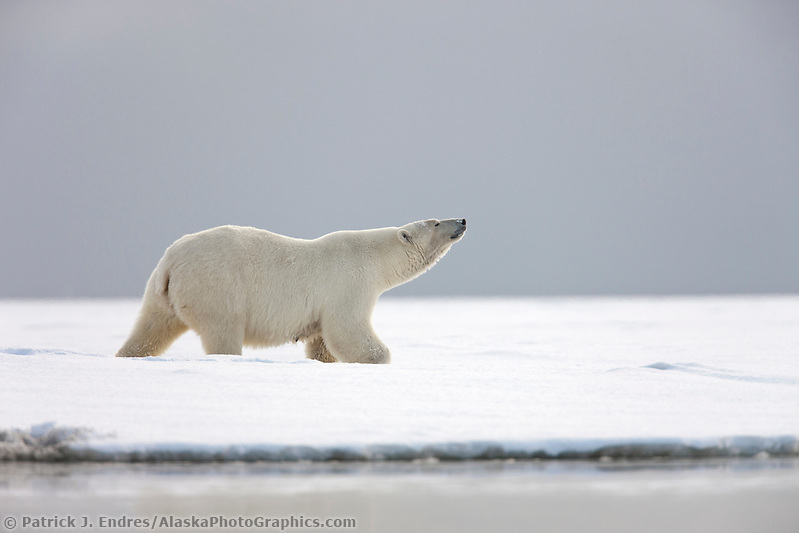 Polar bears live along the northern Arctic shores and offshore icepack. 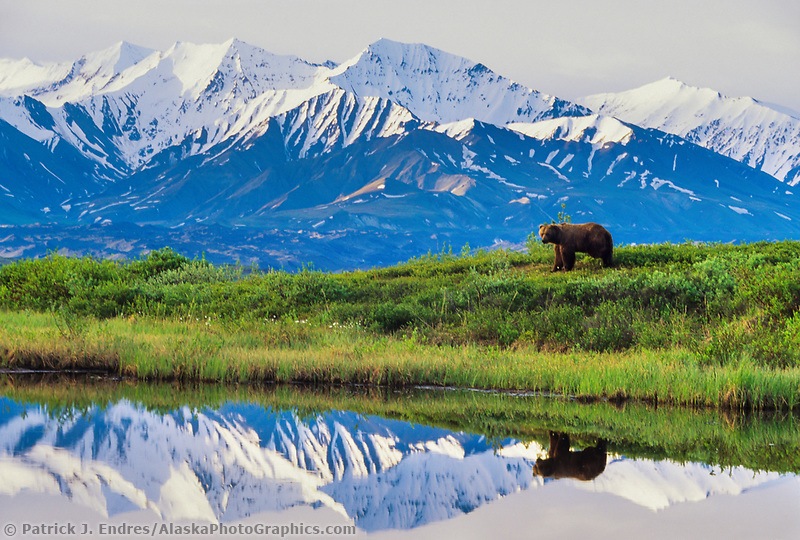 The grizzly bear is common to the Interior and Arctic regions and feeds primarily on vegetation. 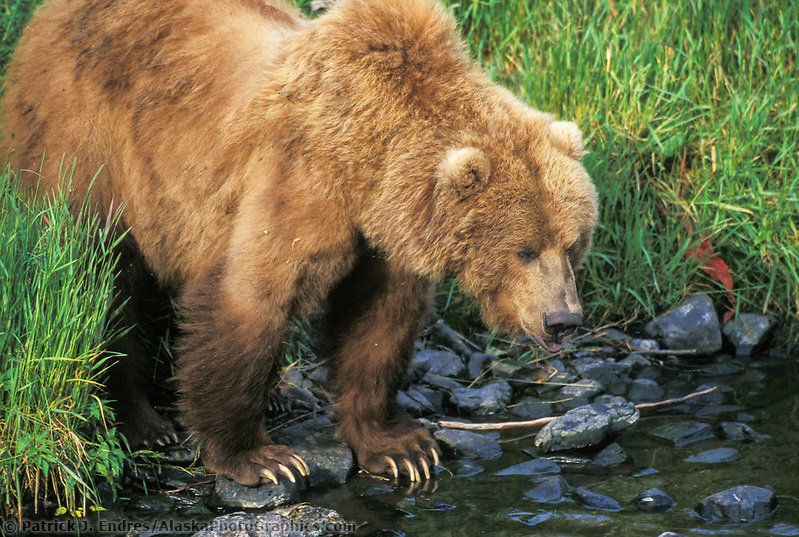 The brown bears, although the same species grow much larger due to the protein-rich diet of salmon found in Alaska’s coastal areas. 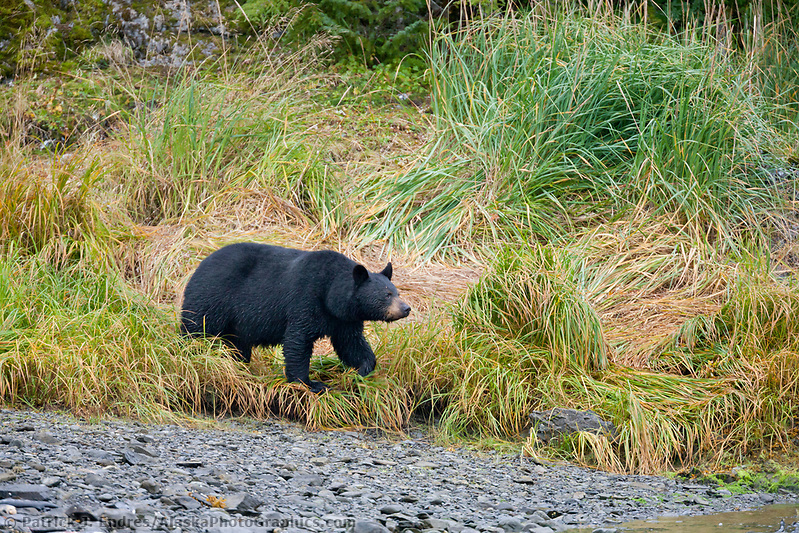 Black bears inhabit the forested and coastal regions and are the smallest of the three bear species. 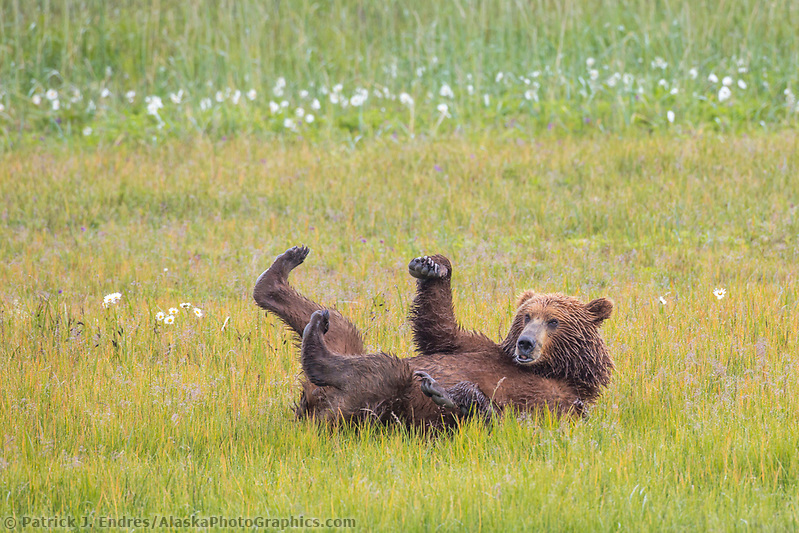 The Alaska bear photos you see here are available to license as stock photos for commercial use, or purchase as fine art prints for home or office. Bears are among all land mammals the most formidable creatures. The utmost respect for their wildness is essential.  Like all mammals, bears communicate with each other. It is wise to learn their language of body posture and behavior. The National Park service offers instruction on how to act in bear country through video kiosks at Park Headquarters. 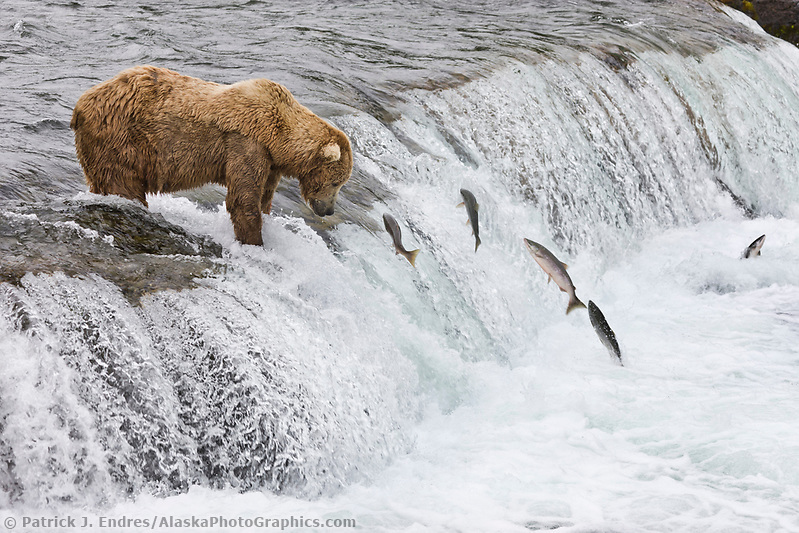 For some places, like Brooks Falls in Katmai, it is required viewing. 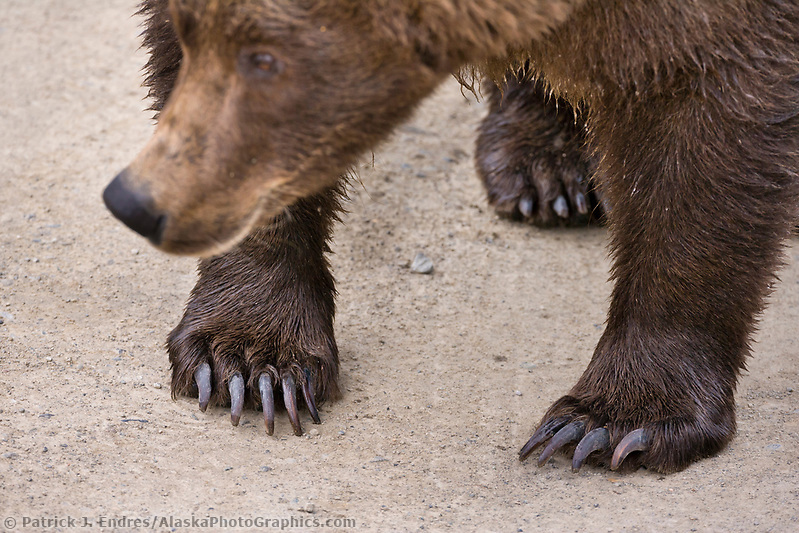 Taxonomists classify brown and grizzly bears as the same species, Ursus arctos. However, brown bears on Kodiak Island are classified as a distinct subspecies (Ursus arctos middendorffi). 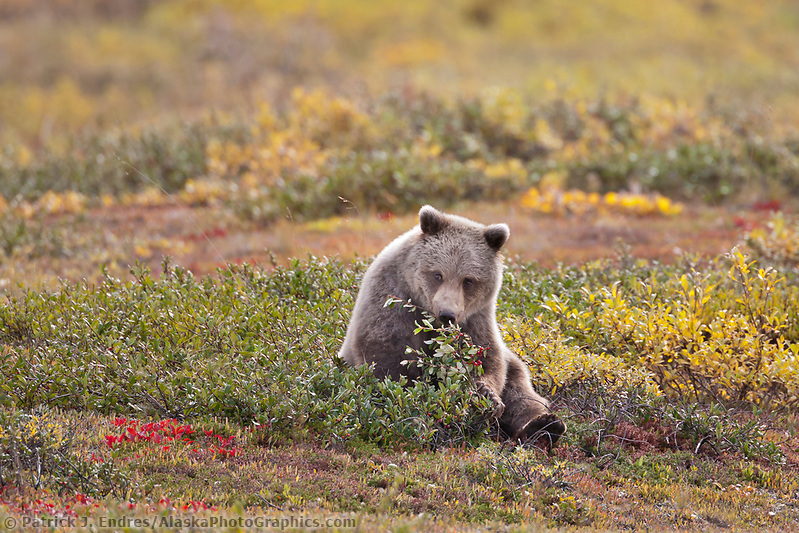 While Ursus arctos are omnivorous, they are mainly differentiated because of their diet. 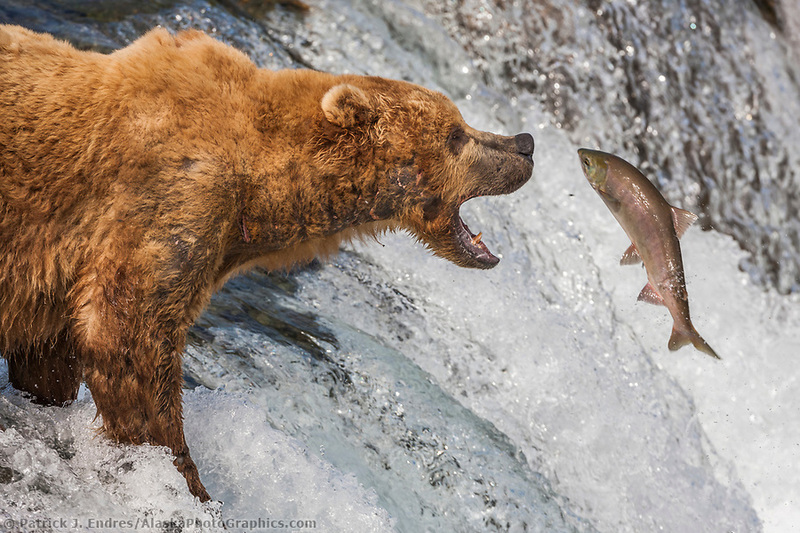 “Brown bear” refers to the bears that inhabit the coastal areas where the protein-rich food source of salmon makes the animal much larger. 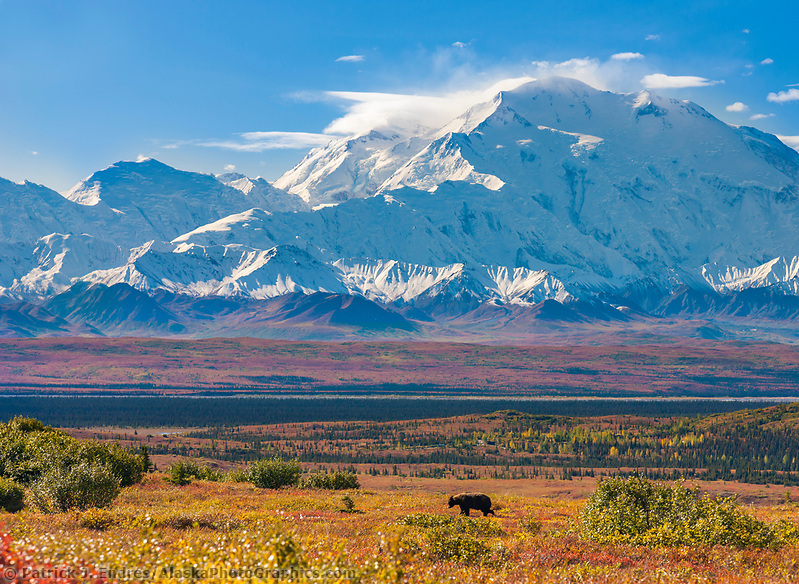 “Grizzlies live in the Interior and Arctic regions and eat mainly a vegetarian diet. Brown Bears appear in many color variations ranging from light brown or blonde, to a dark brown or almost black. The tips of the longer guard hairs may be often lighter. While the brown bear resembles its close relative the black bear (Ursus americanus), it is larger, has a more prominent shoulder hump, smaller ears, and longer, straighter claws. It is these physical characteristics that should be used to distinguish the brown bear from the black bear because both species vary in color. 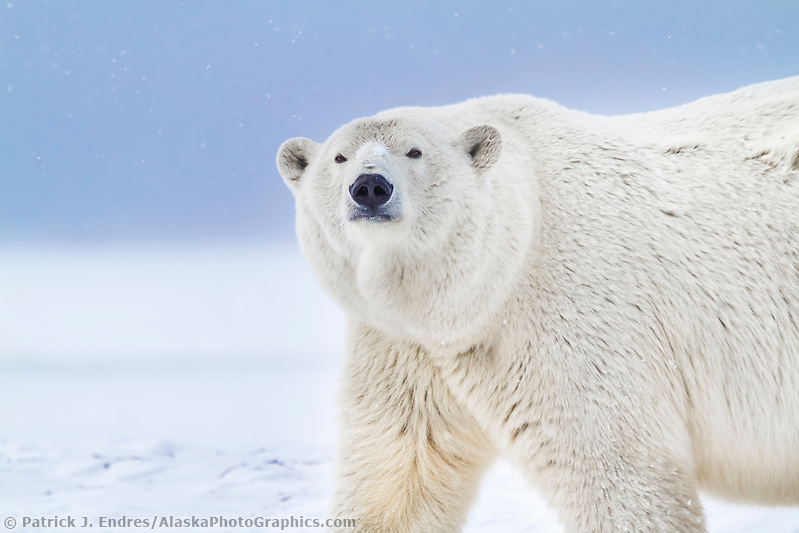 The polar bear is native to Alaska’s Arctic coast and icepack. They travel great distances, roaming the frozen ice during the dark winter months hunting for food. Their thick blubber (up to four inches on the rump) and fur insulate it against the severe cold, and its translucent fur, which appears white or cream-colored, camouflages it from its prey. The bear’s short tail and small ears help reduce heat loss and the narrow head and long, tapered, body streamline it for swimming. 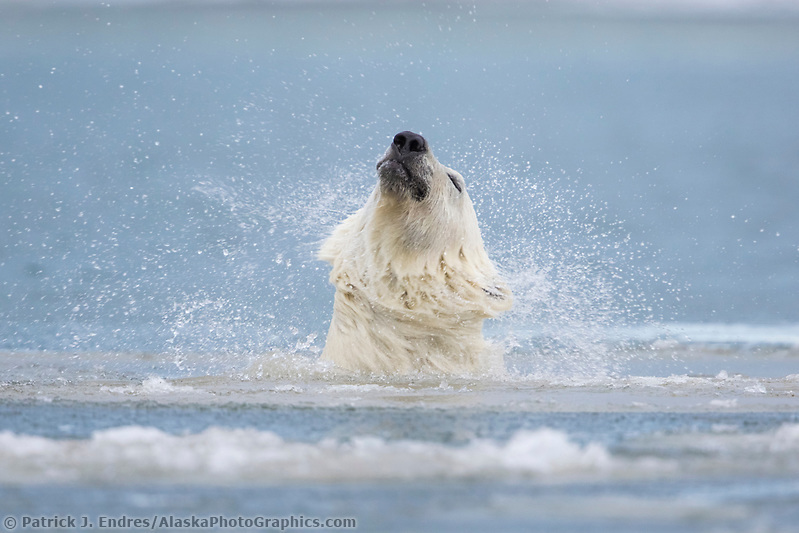 The polar bear has adapted live on land and the ocean and is considered a semi-aquatic marine mammal. 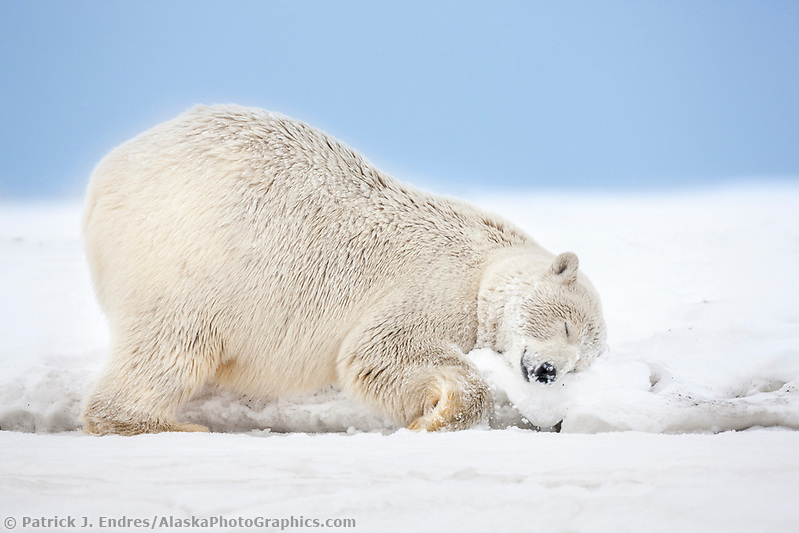 Polar bears depend mainly upon fat-rich seals for food, which it hunts from the pack ice. It has uniquely adapted to a life in the sea and on land and ice. Scientists now believe that the projected decreases in the polar sea ice due to global warming will have a significant negative impact or even lead to the extinction of this species within this century. The population of just between 20,000-25,000 polar bears has been shrinking. 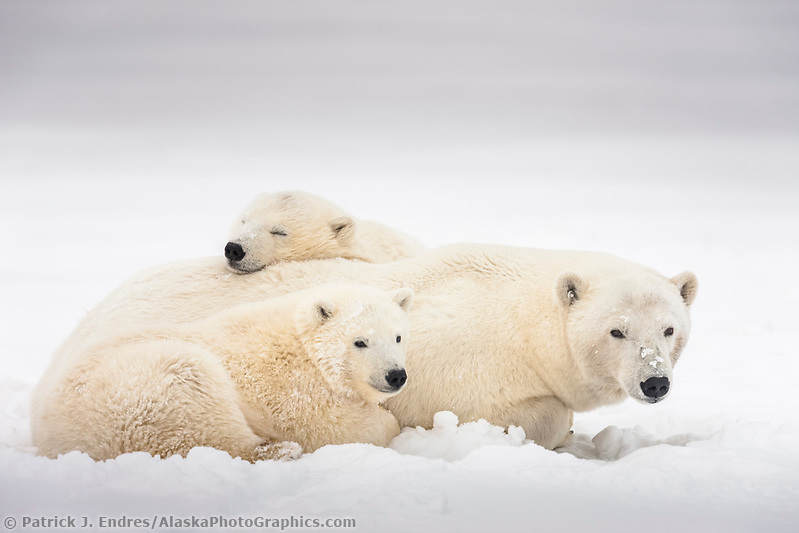 While there are some 18 distinct polar bear populations, the southern Beaufort Sea population in Alaska plummeted from 1500 animals in 2001 to 900 in 2010 (Ecological Applications Journal). The United States Geological Survey estimates that the polar bear population will shrink to 1/3 of its size by the year 2050. These population reductions are mainly due to melting sea ice which limits access to the primary food source for the polar bear. 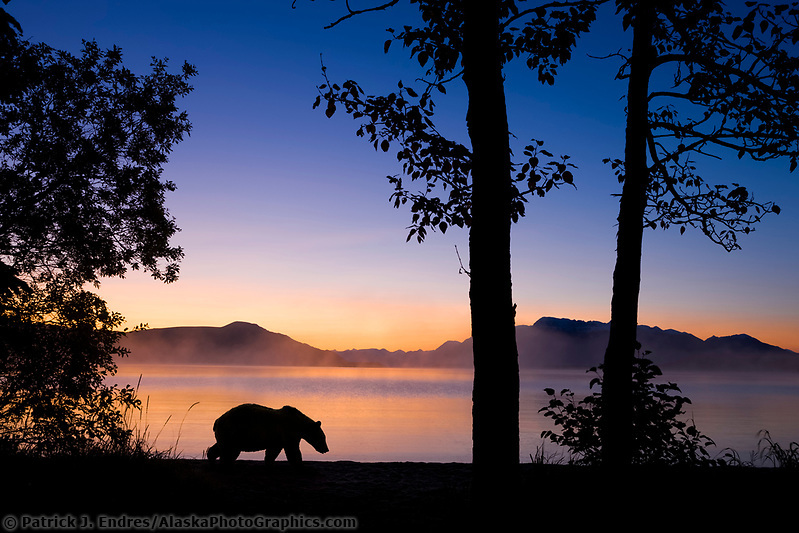 Black bears occur over most of the forested areas of Alaska, except in some areas in the southeast where islands are inhabited only by brown bears. 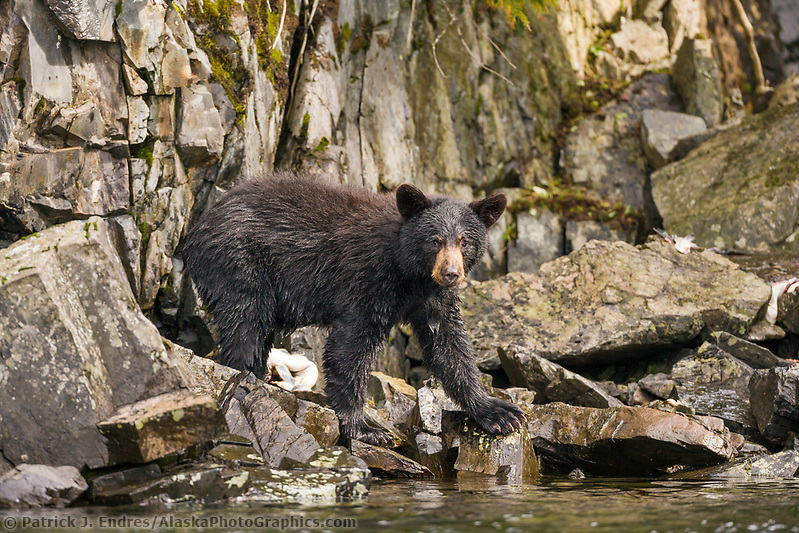 Black bears are most often associated with forests, but they may be found from sea level to higher alpine areas. They hibernate during winter and may build dens in tree cavities, caves and in shallow depressions. Black bears are the smallest of the North American bears and males are larger than females. 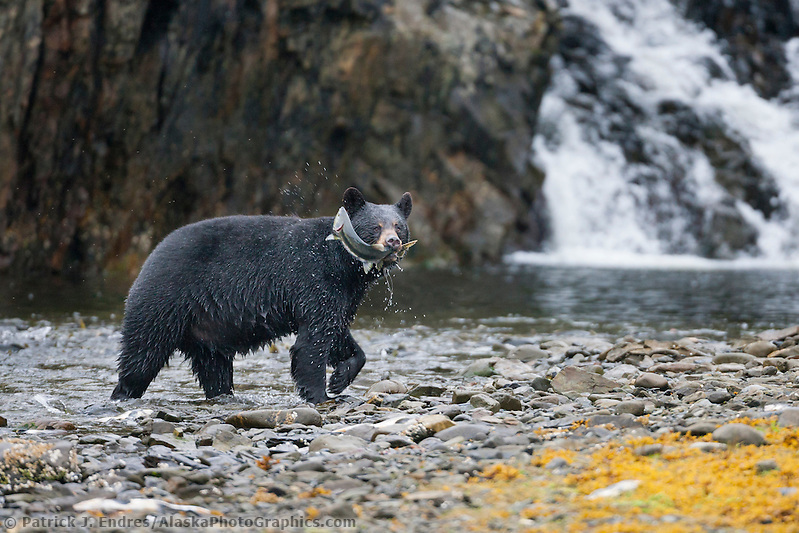 Black bears are opportunistic eaters but most of their diet consists of plants, berries, and insects, in addition to mammals, carrion, and fish. They have many different color phases that range from black, brown, cinnamon, blue-black and sometimes near white, although that is rare.